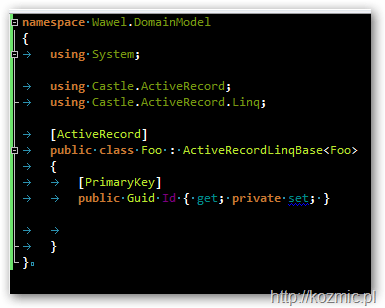 ReSharper’s “hidden” gem – live templates. I’m sure many of you, even those who use ReSharper on a daily basis, almost never use one of its most powerful features – live templates. and I have just saved roughly 30s as compared to bare Visual Studio, but most importantly, I didn’t loose my momentum and focus. Sure it’s a small thing, but that’s how you build a palace – brick by brick. ← Castle Windsor 2.1, Dynamic Proxy 2.2 and more released! You’re using a nice color scheme in VS. Can you export it and publish? Is the ctrl + alt + insert shortcut your own custom-defined? My Resharper only reacts to alt + insert ("Generate").